In our wide-eyed childhood, we like to believe the faster car is the better car. 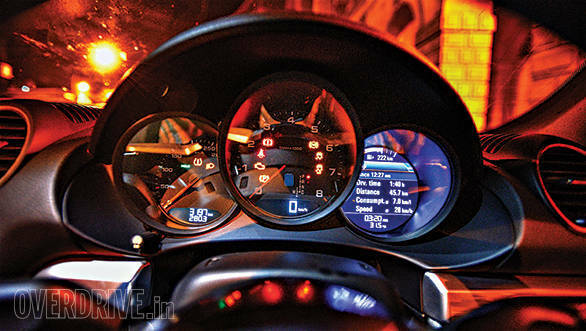 Sportscar awesomeness is measured in 0-100kmph times and top speed bragging rights. Faster is simply better. But the experience of actually driving these cars (yes, it's okay for you to hate me) turned that theory on its head. A great driving experience is exactly that - an experience. Speed is certainly an important prerequisite, but it's not the be-all and end-all. The best sportscars are the ones that elicit giddy head rushes, silly smiles and a sweeping sense of euphoria. These things come in the way a car turns, the sensations it generates through the steering wheel and the all-round connection between man and machine. It's why I have fonder memories of a 140PS Lotus Elise than a 700PS Lamborghini Aventador. It's also why the Porsche Boxster S and Cayman S were widely regarded as the best sportscars in the world, all things considered. 315PS was more than enough to excite, and the magically balanced mid-engined chassis allowed the car to turn as though it had a pivot running right through its centre down to the road. Perfecting the recipe was a screaming, naturally aspirated flat-6 engine that sounded exotic and was a treat in itself. Pure, unadulterated driving joy. And then came the 718. Porsche spruced up the looks a bit, fettled the chassis for even sharper responses, and then went and replaced two cylinders from the marvellous 911-based 3.0-litre flat-6 engine with a turbocharger. To be fair, tightening emissions norms worldwide didn't leave them much choice, but we're not here for cause; it's the effect we're interested in. And that's evident the moment you turn the engine on. You're greeted with a loud but rough and brash note through the twin pipes. The sound gets throatier with higher revs and the 718 certainly announces its arrival, but it's a thriller no more. Along with the different exhaust note comes a big change in the way the engine delivers power. Despite displacing just 2.0-litre vs 3.4-litre in the previous-gen Boxster S, power is still a very healthy 300PS, down by just 15 horses. Torque meanwhile rises from 360Nm to 380Nm and it peaks from a low 1,950rpm to 4,500rpm. As is the case with all modern turbo engines, the midrange now packs a mighty punch, and the way the power comes on at about 4,000rpm gives the 718 an almost muscle car feel. 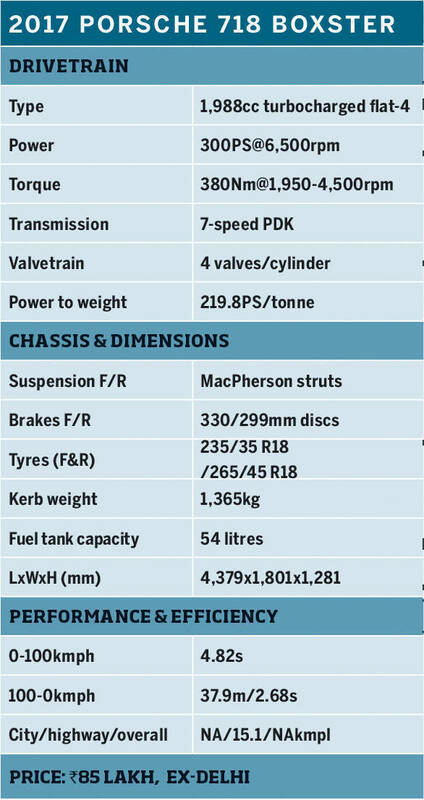 It certainly hits harder, but Porsche has also managed to engineer a lively top end with the car pulling hard to around 7,000rpm, while the redline is at an impressive 7,500rpm. Performance is on a new level. 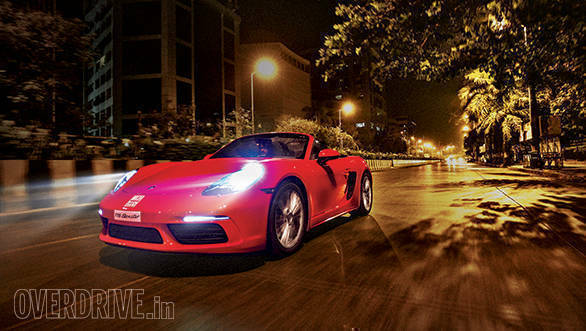 Where the previous Boxster S clocked a 5.91s 0-100kmph time, the base 718 broke the 5s barrier to set a seriously quick 4.82s 0-100kmph run. 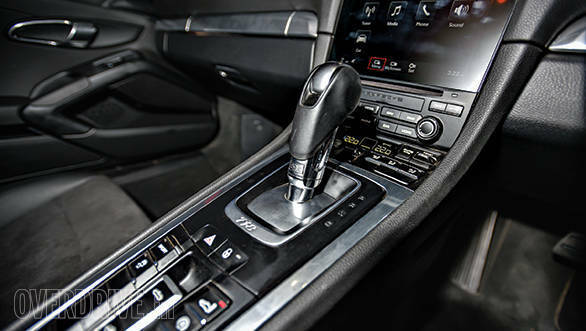 Helping it achieve these times is the always impressive 7-speed PDK gearbox that offers launch control as standard, even in this base model. We didn't have the opportunity to test the 718's mileage in the city, but it returned a family car-rivalling 15.1kmpl on the highway at a steady 100kmph. Turbo lag is well masked in normal driving conditions, and Bert came back raving about the engine from his first drive experience at the Yas Marina Circuit. In the real world, like a night drive through the city as most Indian owners tend to use their cars, turbo lag is a non-issue. However, if you want to properly enjoy a car like this, you've got to take it to a winding mountain road like the flowing ghat section to Aamby Valley. Here, the small-capacity engine and big turbo show their weaknesses, and it's vital to keep the engine on boil. The motor feels dead below 2,000rpm, just about okay at 3,000rpm and then it hits you with a massive surge at 4,000rpm. What this means is that the rear wheels are constantly on the verge of spinning up as you exit corners while the needle crosses 4,000rpm. Traction control has never worked harder in a Boxster and, as a result, the 718 doesn't feel as intoxicatingly balanced and poised as before. Happily, the chassis is now even more of a superlative thanks to learnings acquired from the acclaimed Cayman GT4. The electronically assisted steering isn't ripe with feel, but its added quickness and directness is deeply satisfying. The sense of chassis balance has not been altered, and the 718 still corners like your mind and the wheels are telepathically linked, perhaps even more so with this model update. Nevertheless, flat-out driving pleasure is probably of less relevance to the Indian buyers than whether the car can handle our roads. 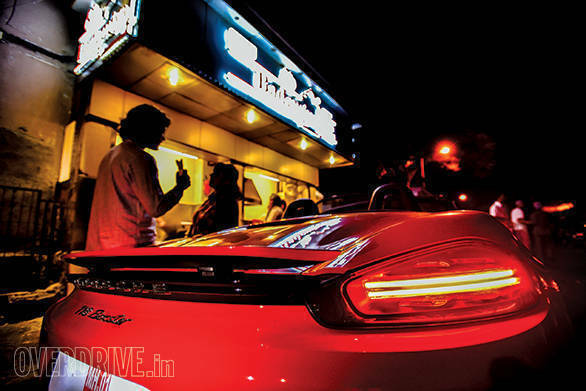 Once again, the 718 shines remarkably bright. Ground clearance is good enough that you don't need to do the whole zig-zag crawl over speed breakers and ride quality is pleasantly supple. Plush it isn't, but with some care through potholes and over speedbumps, the 718 is an easy and relatively stress-free car to drive. Adjustable suspension is an optional extra and the standard Sport button on the console only adjusts engine and gearbox response. 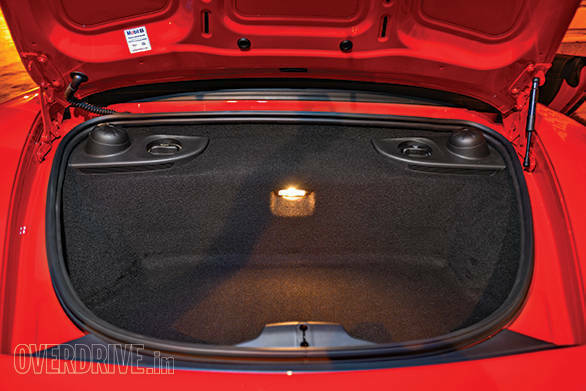 There's also a combined 275 litres of storage space between the front and rear luggage compartments - the folding roof doesn't intrude into this space. 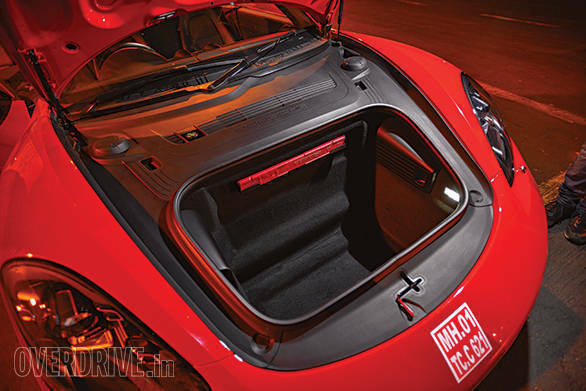 Unfortunately, neither can hold a spare wheel, so Porsche has to mount the space-saver behind the passenger seat to comply with Indian regulations that require a spare wheel to be provided with the car. This renders the seat pretty useless, and I see most owners choosing to leave the spare at home. The spare wheel was not provided for our test. 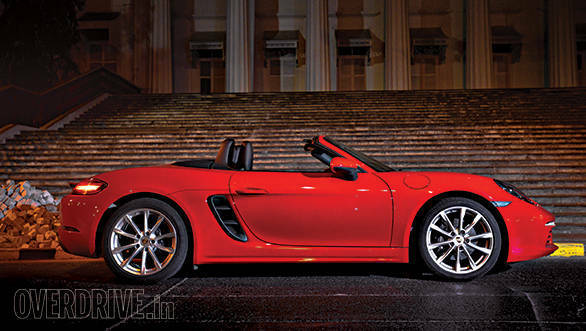 Features wise, the 718 Boxster is quite a simple car that's more driver focussed and less biased to luxuries. The seats adjust manually, there's no fancy leather-wrapped dashboard and almost all the space for buttons on the centre console is blank. 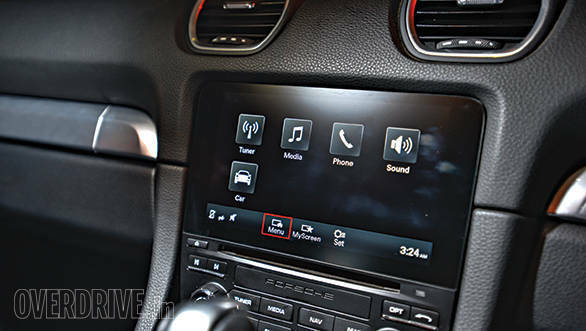 Porsche tends to have a huge options list available for their cars, so you should be able to spec it to your heart's content. 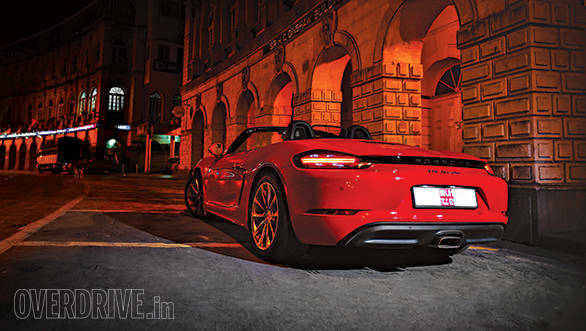 Overall, the 718 Boxster remains an excellent sportscar and is still the best of its kind out there. However, you can't shake the feeling that while it raises the performance stakes, it also takes a small step backward in terms of exotic feel and emotional connect. 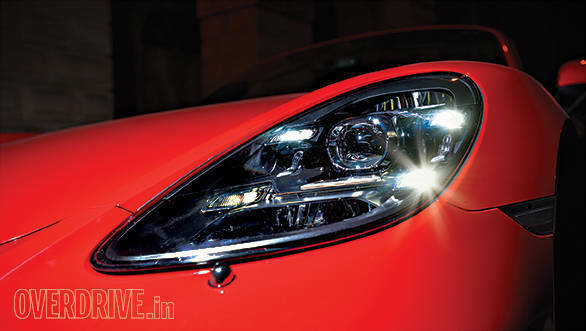 However, Porsche India has an ace up its sleeve in terms of the price. Thanks to the engine displacing just below 2.0-litres, the tax structure allow a more affordable price. 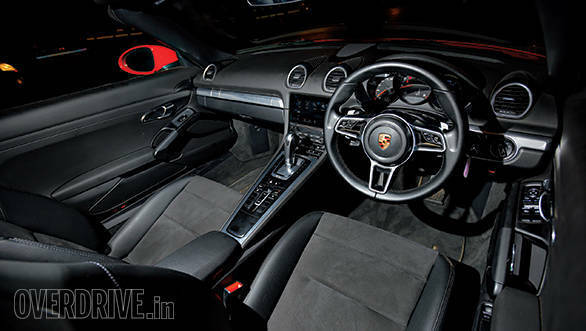 The result is a Rs 85 lakh (ex-Delhi) price tag that is roughly Rs 25 lakh cheaper than the previous Boxster S. That makes the 718 Boxster tremendous value and changes what it stands for in our market. Simply put, what used to be an incredible sportscar experience has become exceptional sportscar value.